Motivated Seller! As you enter this private tropical and fully landscaped compound, there is a mixture of Hawaiian and Mediterranean ambiance. 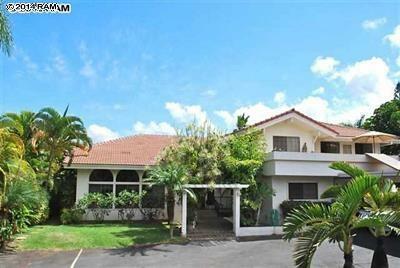 You are greeted with a circular driveway and carport for the main home and front 2 bedroom attached Ohana. As you enter the double doors you and step into the 20’ vaulted foyer, the grand spiral staircase invites you up to the master suite level. This home features a sunken formal living room that opens to a dining area. An open floor plan with high ceilings makes every room inviting. A separate entertainment/media room has a wall of windows overlooking the swimming pool and pool cabana studio.